Feeding a cat seems simple enough. Just pour some dry food in a big bowl, and you’re done. But the best diet for cats isn’t quite that easy. Cats are obligate carnivores and need protein from animal sources, not the grain in dry food. And they need moisture with their food, not a bowl of water. So pitch that bag of dry food and follow this simple guide to feline nutrition instead. Cats are descended from desert wild cats and evolved eating lizards, birds and mice. Today’s domesticated house cats would eat the same way if they could. The best diet for cats has the same nutritional properties as a mouse, says veterinary endocrinologist Deborah Greco. A mouse is about 40-45 percent protein, three percent carbohydrate and 40-45 percent fat. Cats are obligate carnivores and need meat. The best diet for cats contains protein and moderate amounts of fat from animal sources. Cats convert animal fat to energy; it’s the carbohydrates in dry food that really pack on the pounds. About 20-30 percent of the cat’s daily caloric intake should come from meat, fish or poultry. Another 15-20 percent should come from fat. Cats lack some of the enzymes and mechanisms needed to cope with high-carbohydrate diets. Writing for the Winn Feline Foundation, veterinarian Susan Little says cats need some carbs in their diets, but “excess carbohydrates are not burned as energy, but are instead converted to triglycerides and stored as fat.” Most brands of dry cat food contain large amounts of grain, are high-carb and are thought to be the main cause of feline obesity. Cats also lack the enzymatic pathways to use dietary fiber efficiently. Feline nutrition experts say no more than 10 percent of a cat’s daily diet should consist of fiber, or fruits and vegetables. While we can’t replicate our cats’ natural diet exactly, raw, homemade or canned wet food mimics an all-prey-diet more closely than dry food does. Wet food is higher in fat and protein, and contains fewer carbs. And the higher moisture content keeps cats well-hydrated and maintains the urine at the proper pH to discourage the formation of bladder stones and crystals. 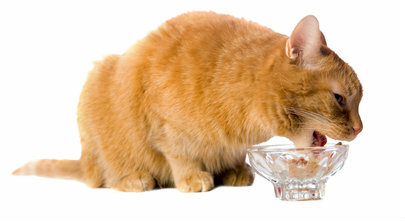 Many veterinarians believe cats who eat all- or mostly-dry-food diets are always slightly dehydrated. And studies show that bladder stones and crystals, obesity and diabetes are more common in cats who eat all or mostly dry food. Like humans, cats need the right number of calories to maintain a healthy body weight. The best diet for cats who weigh eight pounds has about 30 calories per pound of body weight per day. Cats with large frames need more. Petite cats need fewer calories. Calories are expressed as Kcals on cat food labels. Kcals and calories are exactly the same. Evolution plays a part in the way cats like to eat. Like their desert-dwelling ancestors, today’s outside cats eat several small prey animals a day. Cats who live inside don’t have the luxury of snagging a bug or catching a mouse when they feel hungry. But free feeding wet food or providing several small meals a day replicates a cat’s natural feeding pattern and can reduce stress in indoor cats. It also prevents the gorging that causes cats to regurgitate their food and creates acidic urine, which discourages the formation of urinary tract stones and crystals, according to veterinarian Holly Nash of Peteducation.com. Making the case for free feeding, researchers at the University of Southampton, U.K. found that in contrast to pack animals like dogs, cats are generally able to maintain their normal body weight even when allowed to free feed by taking several small meals a day and adjusting the size of the meals according to the energy density of the food available. When feeding your cat, try to think like a cat, not a human. The best diet for cats is species appropriate food served in cat-size portions and on the cat’s schedule. If you can follow this simple guide to cat nutrition, your cats will be happy, healthy and fit for many years to come.